I’m someone who gets really excited about finding bargains. When I come across a great find in fashion, jewelry or shoes I want to wear it, so I’ll find a way to work it into my wardrobe. Well the other day I found a bargain of a different kind, a grocery store bargain. 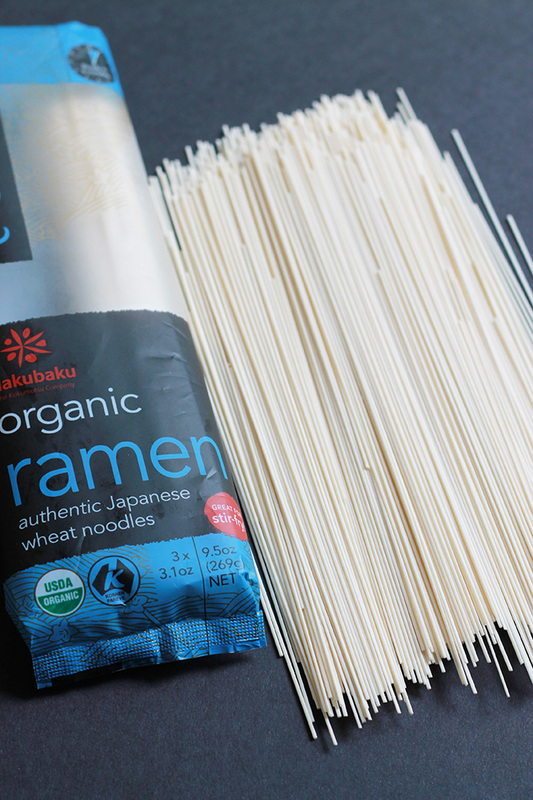 Organic ramen noodles only $1.69 each on clearance. But this wasn’t the ramen in the square package from my college days, that I actually ate uncooked as a crispy snack. I stocked up! Now I had to come up with a way to fit into my weekly menu, which was really easy. 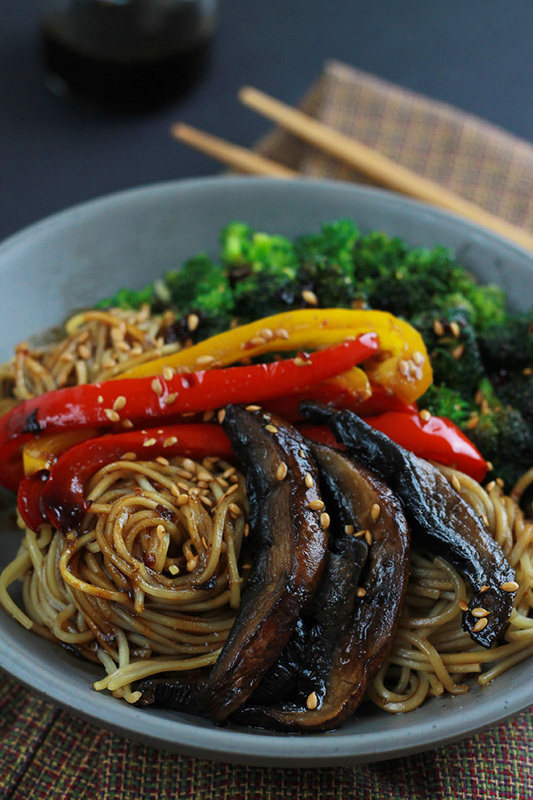 I simply used what I had on hand in my fridge, which were portobello mushrooms, super hearty with a meaty feel, peppers, onions and broccoli. The other important ingredient is the sauce. 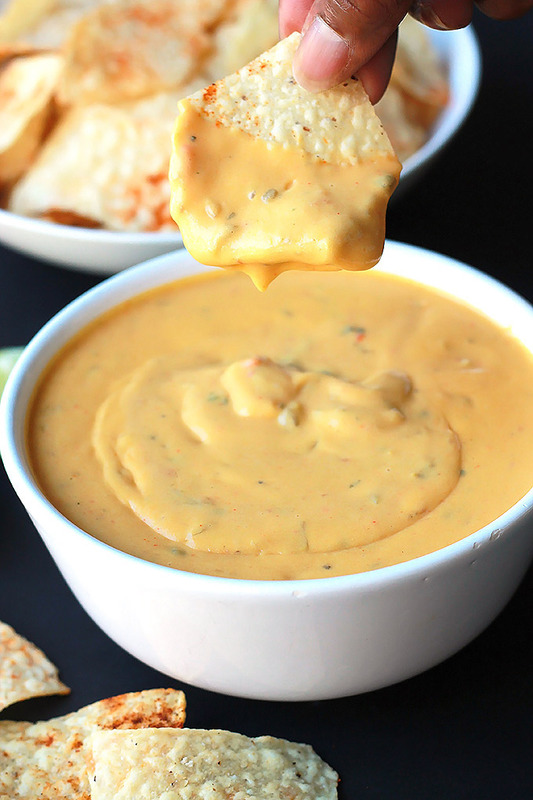 You’ve got to use a good tasty sauce to bring it all together. I used my Vegan Teriyaki Sauce which has a bit of a spicy kick. 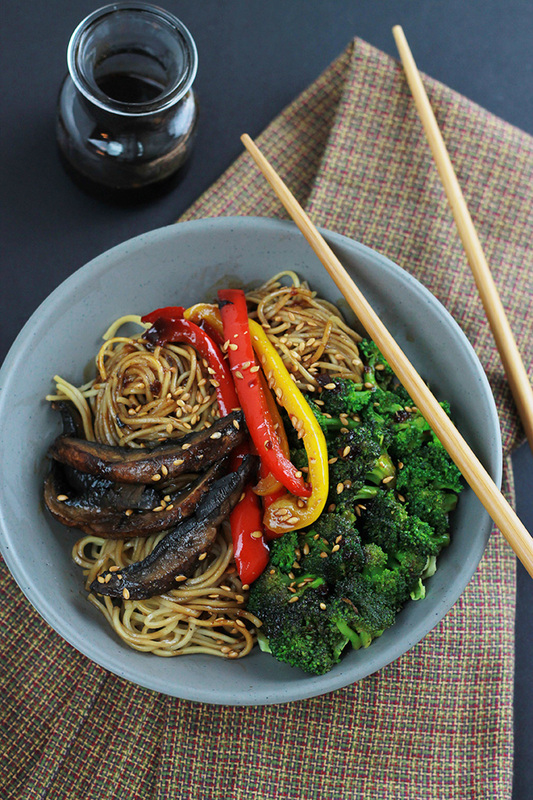 This Spicy Ramen Vegetable Stir-Fry is oh so quick and easy. What’s nice about this dish is that you can totally make it with your favorite veggies and sauce, so versatile. Happens to be a good way to clean out your fridge. And did I mention that it’s super quick. Boil, chop, sauce, eat. While you are waiting on the water to come to a boil, heat a large skillet over medium heat, add oil and onions and saute about one minute. Add peppers to pan and continue to saute another 1 to 1 and half minute, add small amount of water to pan if needed to prevent food from sticking to bottom of pan. If water has come to a boil prepare noodles for two following directions on the package. When the peppers start to soften add the garlic and ginger to the pan, saute another minute then transfer everything in skillet to a bowl. Add a small amount of oil to pan if needed and add the broccoli to the pan. Saute broccoli 1 minute, add the onions and peppers back to the pan along with the vegan teriyaki sauce, toss to coat everything. 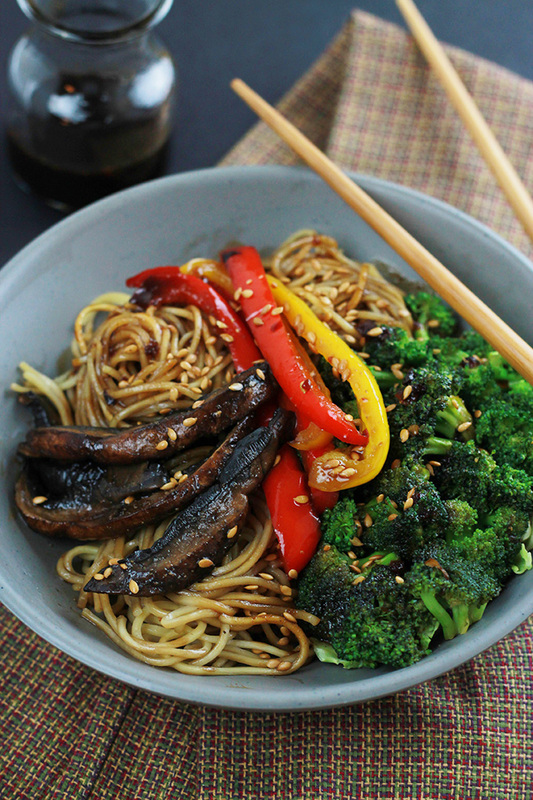 Serve vegetables over the ramen noodles, sprinkled with toasted sesame seeds. You can also sprinkle with red pepper flakes and drizzle with a small amount of toasted sesame oil just before serving if desired. If you make this recipe or a version of it, take a picture and share with me on Instagram, tag it #thewholeserving or leave a comment below. 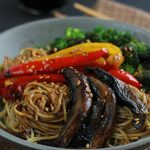 I’d love to see or hear about your version of this Spicy Ramen Vegetable Stir-Fry. What a gorgeous ramen bowl! Love those hearty portobellos and broccoli is one of my favorites 🙂 Plus, anything this loaded up with veggies is always going to be calling my name! And a spicy sauce to finish it off? I’m so in! Pinned! Kathryn I hope you have a chance to give this a try soon. What I like about this recipe is the fact that you can use the veggies you have on hand and it will still be tasty. Wow! This looks absolutely delicious. Looks straight out of my mom’s kitchen and completely genuine. Thank you Lisa, I think I would like to visit your Mom’s kitchen. Looks tasty! A great way to eat your vegetables, too!! My husband would appreciate the spice. I like it spicy but not too spicy, I hope you get to make it for him. This looks just like my kind of dish. I love a bit of spice and this looks so healthy too! Hi Lynn, I hope you had a chance to enjoy this recipe, if not maybe someday real soon. Thanks for stopping by. Oh my word! I need to find those ramen noodles! They look so good. Thank you for sharing with Delicious Dishes Recipe Party this week! If you have a Whole Foods I think you can get them there. Hopefully you will have a chance to try this soon. Noodles and veggies with chicken such a staple in our house, looking forward to trying your recipe! Thanks so much for sharing it with us at Snickerdoodle Sunday! Pinned and tweeted. Celeste, I had soba noodles for the first time and I’m back in the Stir fry business. I love all the veggies, it’s perfect for Georgia. I can always add meat for those who want it. I make an “ok” sauce, so I’m definitely going to use your teriyaki recipe, so excite to try it, it looks yummy!!! Yeah, I think that your daughter would really like a dish like this one. It’s so filling as well as delicious. I love this recipe because i can’t tell you how many times we have thrown together a last minute meal by just looking at what we have on hand! I’ll tag this when we make it! You’re right, this is a perfect recipe for cleaning the fridge. It’s alyways delicious and filling. Oh yum – this looks delicious! I’m definitely pinning your recipe! 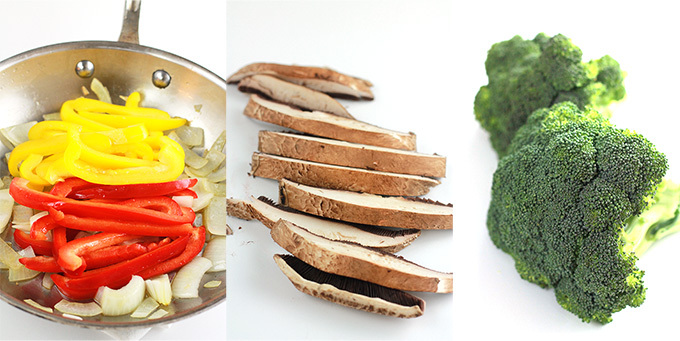 Stir fry dishes are some of my favorites – they’re so quick to put together, and they’re so tasty. 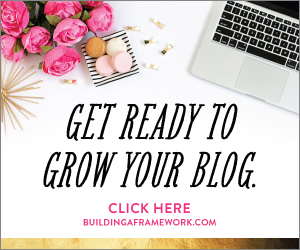 Thanks for linking up with Merry Monday. That is the nice thing about stir-frys, simple ,quick and so easy. This dish looks so beautiful and tasty! I’d love it if you’d share the recipe at the Healthy Living Link Party that opens at 7:00 Central time this evening. Thanks!